The album was recorded during a period of turmoil in the band, as Brian Jones, the band's founder and original leader, had become increasingly unreliable in the studio due to heavy drug use, and during most recording sessions was either absent, or so incapacitated that he was unable to contribute meaningfully. He was fired in the midst of recording sessions for this album, and replaced by Mick Taylor. Jones only appeared on this album on two songs, playing backing instruments, and would die within a month of being fired. Taylor had only been hired after principal recording was complete on many of the tracks, as such he only appears on two of the tracks as well, having recorded some guitar overdubs. As such, Keith Richards was the band's only full-time guitarist during most of the recording sessions, and nearly all of the rhythm and lead parts are recorded by him. The rest of the Stones, Mick Jagger (lead vocals), Bill Wyman (bass guitar), and Charlie Watts (drums) appear on nearly every track, and significant additional contributions were made by percussionist Jimmy Miller (who also produced the album), keyboardists Nicky Hopkins and Ian Stewart, and numerous other guest musicians. The album charted as a top-ten album in several markets, including reaching number one in the UK and number three in the US. While no highly-charting singles were released from the album, many of the album's songs became staples in Rolling Stones shows and on rock radio stations for decades to come, including two gospel-infused songs "Gimme Shelter" and "You Can't Always Get What You Want", both of which ranked highly on retrospective "best ever" songs lists, including 2004's "500 Greatest Songs of All Time" by Rolling Stone magazine. Although the Stones had begun the recording of "You Can't Always Get What You Want" in November 1968, before Beggars Banquet had been released, recording for Let It Bleed began in earnest in February 1969 and continued sporadically until early November. Brian Jones had, over the course of the recording of the previous two albums, become increasingly unreliable. Though present in the studio, he was frequently too intoxicated to contribute meaningfully, and missed several recording sessions recovering from a motorcycle accident that occurred in May, 1969. Always a talented multi-instrumentalist, Jones had previously contributed extensively on guitar, forming an integral part of the dual-guitar sound that was central to the band's groove. He was fired from the band during the recording of Let It Bleed, having performed on only two tracks: playing the autoharp on "You Got the Silver", and percussion on "Midnight Rambler". As with the previous album, most of the guitar parts were recorded instead by the band's other guitarist, Keith Richards during the period of principle recording. Jones's replacement, Mick Taylor, only appears on two tracks, "Country Honk" and "Live with Me", having contributed some overdubs during the October Los Angeles sessions. He also appears on "Honky Tonk Women", a stand-alone single which was recorded during the Let It Bleed sessions. Keith Richards sang his first solo lead vocal on a Rolling Stones recording with "You Got the Silver"., having previously sung harmony and background vocals with primary vocalist Mick Jagger on "Connection" and shared alternating lead vocals with Jagger on parts of "Something Happened to Me Yesterday" and "Salt of the Earth". Additional vocals were provided by the The London Bach Choir, who sang on "You Can't Always Get What You Want". The choir distanced themselves from their contribution, however, citing what author Stephen Davis terms its "relentless drug ambience". Bassist Bill Wyman appears on every track except for two; on those Keith Richards played bass. Drummer Charlie Watts performed on all of the tracks except for "You Can't Always Get What You Want"; he struggled with getting the correct groove, so producer Jimmy Miller filled in for him instead. 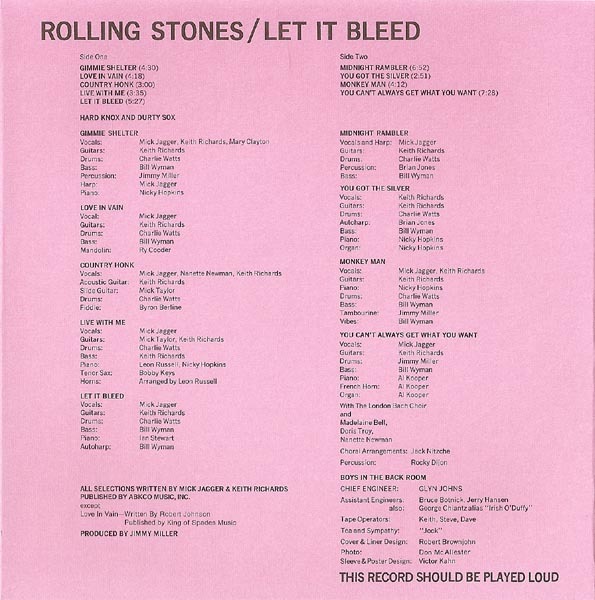 Let It Bleed was originally scheduled for release in July 1969. Although "Honky Tonk Women" was released as a single that month, the album itself suffered numerous delays and was eventually released in December 1969, after the band's US tour for it had already completed. The majority of the album was recorded at Olympic Studios in London, with further work taking place at Elektra Sound Recorders Studios, in Los Angeles, California, while the Stones prepared for the tour. The Los Angeles-recorded portions included overdubs by guest musicians Merry Clayton (on "Gimme Shelter"), Byron Berline (on "Country Honk"), and Bobby Keys and Leon Russell (on "Live with Me"). Finally, an unreleased version of "I Don't Know The Reason Why (a. k. a. Hillside Blues)" was also recorded there in October 1969 with Mick Taylor. Like Beggars Banquet the year before, the album marks a return to the group's more blues-based approach that was prominent in the pre-Aftermath period of their career. The main inspiration during this string of albums was American roots music and Let It Bleed is no exception, drawing heavily from gospel (evident in "Gimme Shelter" and "You Can't Always Get What You Want"), Hank Williams and Jimmie Rodgers ("Country Honk"), Chicago blues ("Midnight Rambler"), as well as country blues ("You Got The Silver", "Love In Vain") and country rock ("Let It Bleed"). The lyricism found on Let It Bleed is often noted for its violent and cynical undercurrents. Jann S. Wenner, in a 1995 Rolling Stone interview with Jagger, described the album's songs as "disturbing" and the scenery as "ugly". He also asked Jagger if the Vietnam War played a role in the album's worldview. Jagger said: "I think so. Even though I was living in America only part time, I was influenced. All those images were on television. Plus, the spill out onto campuses". The album cover displays a surreal sculpture designed by Robert Brownjohn. 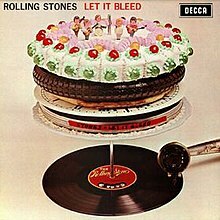 The image consists of the Let It Bleed record being played by the tone-arm of an antique phonograph, and a record-changer spindle supporting several items stacked on a plate in place of a stack of records: a film canister labelled Stones – Let It Bleed, a clock dial, a pizza, a motorcycle tyre and a cake with elaborate icing topped by figurines representing the band. The cake parts of the construction were prepared by then-unknown cookery writer Delia Smith. The reverse of the LP sleeve shows the same "record-stack" melange in a state of disarray. The artwork was inspired by the working title of the album, which was Automatic Changer. Let It Bleed was the Stones' last album to be released in an official mono version, which is rare and highly sought-after today. This mono version is merely a 'fold-down' of the stereo version. Nevertheless it was included in 'The Rolling Stones in Mono'(2016) box set. The album was released in US as an LP record, reel to reel tape, audio cassette and 8-track cartridge in 1969, and as a remastered CD in 1986. In August 2002, it was reissued in a remastered CD and SACD digipak by ABKCO Records, and once more in 2010 by Universal Music Enterprises in a Japanese only SHM-SACD version. The album was included in Robert Christgau's "Basic Record Library" of 1950s and 1960s recordings, published in Christgau's Record Guide: Rock Albums of the Seventies (1981). In 2000, Q magazine ranked it at number 28 in its list of "The 100 Greatest British Albums Ever". In 2001, the TV network VH1 placed Let It Bleed at 24th on their "100 Greatest Albums of R 'n' R" survey. In 1997, it was voted the 27th "Best Album Ever" by The Guardian. In 2003, Rolling Stone ranked it at number 32 on the magazine's list of the "500 Greatest Albums of All Time". All tracks written by Mick Jagger and Keith Richards, except "Love in Vain" by Robert Johnson. Early US editions of the album credit the song to Woody Payne, a pseudonym used by a music publisher of the songs of Robert Johnson. ^ Ian. "Let It Bleed". www.timeisonourside.com. ^ Egan, Sean (2005). Rolling Stones and the making of Let It Bleed. Unanimous Ltd. pp. 206–. ISBN 1 90331 877 7. ^ Decca. "Inner sleeve credits". Retrieved 13 July 2012. ^ a b Davis, Stephen (2001). Old Gods Almost Dead: The 40-Year Odyssey of the Rolling Stones. New York, NY: Broadway Books. p. 306. ISBN 0-7679-0312-9. ^ Bonanno, Massimo (1990). The Rolling Stones Chronicle. London: Plexus Publishing. pp. 86, 93. ISBN 0-207-16940-3. ^ Wyman, Bill (2002). Rolling with the Stones. London: Dorling Kindersley. p. 356. ISBN 0-7513-4646-2. ^ Davis, Stephen (2001). Old Gods Almost Dead: The 40-Year Odyssey of the Rolling Stones. New York, NY: Broadway Books. pp. 304, 305. ISBN 0-7679-0312-9. ^ a b McPherson, Ian. "Country Honk". www.timeisonourside.com. Retrieved 25 October 2016. ^ McPherson, Ian. "Midnight Rambler". www.timeisonourside.com. Retrieved 25 October 2016. ^ Ian. "Let It Bleed". www.timeisonourside.com. Retrieved 25 October 2016. ^ Unterberger, Richie. "Let It Bleed". AllMusic. Archived from the original on 2 October 2011. Retrieved 17 June 2015. ^ "The Rolling Stones Top 10 Albums" > "2. Let It Bleed". mojo4music.com. Retrieved 11 September 2015. ^ McPherson, Ian. "Love In Vain". www.timeisonourside.com. Retrieved 25 October 2016. ^ McPherson, Ian. "You Can't Always Get What You Want". www.timeisonourside.com. Retrieved 25 October 2016. ^ McPherson, Ian. "Monkey Man". www.timeisonourside.com. Retrieved 25 October 2016. ^ McPherson, Ian. "Let It Bleed". www.timeisonourside.com. Retrieved 25 October 2016. ^ McPherson, Ian. "You Got the Silver". www.timeisonourside.com. Retrieved 25 October 2016. ^ McPherson, Ian. "Live with Me". www.timeisonourside.com. Retrieved 25 October 2016. ^ "Delia and The Rolling Stones". Delia Online. 20 January 2017. Retrieved 14 December 2017. ^ Popeson, Pamela (12 September 2013). "Let Them Eat Delia's Cake, or Robert Brownjohn's Let It Bleed". moma.org. Retrieved 14 December 2017. ^ "Royal Mail puts classic albums on to stamps". The Guardian. London. 21 November 2009. Retrieved 14 December 2017. ^ Hall, John (7 January 2010). "Royal Mail unveil classic album cover stamps". The Independent. London. Retrieved 14 December 2017. ^ "Review: The Amazing World of MC Escher". Herald Scotland. Retrieved 21 April 2016. ^ Higgins, Chris. "How Mick Jagger Got Dissed By M.C. Escher". Mental Floss. Retrieved 21 April 2016. ^ Unterberger, Richie. "Let It Bleed - The Rolling Stones : Songs, Reviews, Credits". AllMusic. All Media Network. Retrieved 17 June 2015. ^ a b c d "The Rolling Stones Let It Bleed". Acclaimed Music. Retrieved 15 November 2014. ^ "Let It Bleed CD". Muze Inc. Retrieved 21 June 2008. ^ a b "Review: Let It Bleed". NME. London: 46. 8 July 1995. ^ a b Edwards, Gavin (2 September 2004). "Review: Let It Bleed". Rolling Stone. New York: 147. ^ "Album Reviews: The Rolling Stones – Let it Bleed". Rolling Stone. Retrieved 31 October 2009. ^ MacNeil, Jason (23 August 2004). "The Rolling Stones: Beggars Banquet / Let it Bleed". PopMatters. Archived from the original on 19 October 2012. Retrieved 31 October 2009. ^ Steven Van Zandt. "The Immortals – The Greatest Artists of All Time: 4) The Rolling Stones". The RollingStone. Retrieved 31 October 2009. ^ "Let It Bleed". Rolling Stone. January 2003. Retrieved 21 August 2011. ^ "Top RPM Albums: Issue 6114". RPM. Library and Archives Canada. Retrieved 11 June 2016. ^ "Dutchcharts.nl – The Rolling Stones – Let It Bleed" (in Dutch). Hung Medien. Retrieved 11 June 2016. ^ "Offiziellecharts.de – The Rolling Stones – Let It Bleed" (in German). GfK Entertainment Charts. Retrieved 11 June 2016. ^ "Norwegiancharts.com – The Rolling Stones – Let It Bleed". Hung Medien. Retrieved 11 June 2016. ^ "Rolling Stones | Artist | Official Charts". UK Albums Chart. Retrieved 11 June 2016. ^ "The Rolling Stones Chart History (Billboard 200)". Billboard. Retrieved 11 June 2016. ^ "Swedishcharts.com – The Rolling Stones – Let It Bleed". Hung Medien. Retrieved 11 June 2016. ^ "Lescharts.com – The Rolling Stones – Let It Bleed". Hung Medien. Retrieved 11 June 2016. ^ "Canadian album certifications – The Rolling Stones". Music Canada. Retrieved 11 June 2016. ^ "British album certifications – The Rolling Stones". British Phonographic Industry. Retrieved 11 June 2016. Select albums in the Format field. Select Platinum in the Certification field. Type The Rolling Stones in the "Search BPI Awards" field and then press Enter. ^ "American album certifications – The Rolling Stones". Recording Industry Association of America. Retrieved 11 June 2016. If necessary, click Advanced, then click Format, then select Album, then click SEARCH.